It was a good week. I didn't feel anxious at all, it is my second week without anxiety? I did workout on Monday, Wednesday and Friday. It seems I'm doing well because I can feel some pain on my muscles.. not that kind of pain when you get injured but some pain that make you know you worked your body... like Eminem's song says: a beautiful kind of pain! For tomorrow I'm going to try to wake up at 6 a.m. to do workout before go to work, let's see if I'm able to get up when it is cold. In order to be able to do exercises without feel exhausted, I'm trying to improve my eating. I want to eat more vegetables and fruits and I need to have decent breakfast. 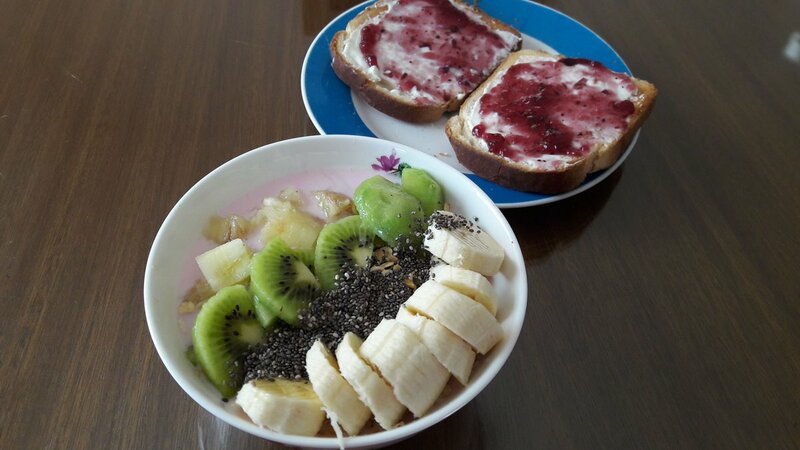 Last 2 days I had fruits, yogurth, cereals and toast. I don't think I can eat eggs at morning but fruits is something that my body accept without get sick. And it looks very delicious for me! Mike and I calculated how many calories it has and this breakfast has around 300-400 cal and all is non fat. I know nothing about nutrition but I guess it is good food to get energy at morning to face the day. ANother thing I have to do about my health is drinking less coffee. I know I have wrote this a lot of times on this journal, but I really need do it. I researched why my vertebral discs are dehydrated and if there is something I can do to hydrate them again. And guess what? vertebral discs get hydrated by the water you drink, and obviously they get dehydrated for the same reason all your body get dehydrated too, so this mean that if you drink much coffee, alcohol, you smoke, etc etc your body and the discs will lose water. I started to drink 3 big cups of coffee every day (sometimes 4 or 5) because my eating and sleeping are bad, and I use coffee to get fast energy (and I love how it taste to be honest). Althought I drink 1.5 to 2 liters of water my body is dehydrated always. I need pee every 1-2 hours. The good thing is that I dont suffer fluid retention even on summer but the bad thing is that this affect my whole body. I start to drink collagen again and I'm going to cut slowly the coffee. If I can wake up early to have a healthy breakfast I can skip the first coffee. The second coffee I can replace for green tea and just drink the coffee I have at 3 p.m., when I start to feel sleepy at work. It seems stupid that I can't stop drinking coffee but I think I'm addicted, so I need to stay strong to get this goal. Yesterday I cleaned the house even when I felt tired, I'm happy I did so today I can spend my time on beauty rutine and do my HTML course. At night I worked on the website of my client with the last changes he asked me to do and I studied English. Mike invited me to watch together the last chapter of dragon Ball and I did, I like this anime. I fell asleep 2 a.m.